development of new industries, etc. creation of city attractions through cultural and artistic activities, etc. Representatives of 13 cities from six countries, including our new member city, Gwangyang City, South Korea, gathered in Vladivostok City to attend the 9th Asian-Pacific City Summit on September 30, 2010. We are currently in an era of intercity competition. With the rapid expansion of globalization, people, goods, funds, and information are swiftly travelling around the globe, and it has come to note that one of the goals of urban policy is to become a city where the four aforementioned matters congregate. Simultaneously, it is also currently an era of intercity partnerships and cooperation. In order to maintain and enhance city vitality while adapting to the rapidly evolving social environments, cities are required to collect and analyze information on international current affairs, and to approach these issues with a combination of knowledge and experiences from different perspectives. One of such effective measures is intercity partnerships and cooperation. 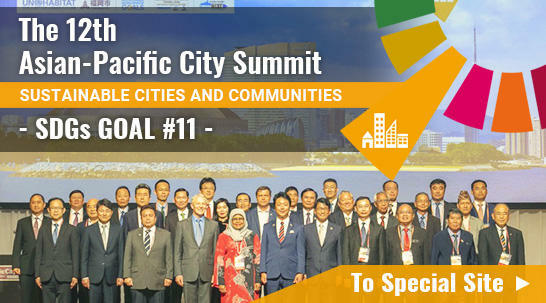 The main topic of this Asian-Pacific City Summit was Sustainable Development of Asian Pacific Cities: New Urban Policies under the Global Economic Crisis, whereas the sub-sessions focused on Efforts for Economic Development and New Urban Development. We acquired information on one another’s city policies, and deliberated on the possibility of intercity partnerships and cooperation. As a result, we confirmed that for sustainable development of the Asian-Pacific region, demonstration of leadership by the member cities in guiding these regions forward, as well as intimate and practical intercity partnerships and cooperation are indispensable hereafter for cities in the Asian-Pacific region. 1. In order to create a new vitality for the Asian-Pacific region, we will enhance sustainable and intimate intercity partnerships and cooperation beyond our current circumstances, by creating more opportunities for sharing of knowledge and experiences, and developing various implementations for and establishing a framework for this mutual learning. 2. We are determined to elevate the international status of the Asian-Pacific region in order to raise the competitiveness of our cities. We will work together to actively promote our potential and possibility to the rest of the world. 3. We will hold the 9th Working Level Conference in Kagoshima City, Japan, in 2011, and the 10th Asian-Pacific City Summit in Pohang City, South Korea, in 2012. Item 1: Admission of Gwangyang City, South Korea to APCS. Item 2: Kagoshima City, Japan, as the host city of the 9th Working-Level Conference in 2011. Item 3: Pohang City, South Korea, as the host city of the 10th Mayors' Summit in 2012. Item 4: Host city for the 11th Mayors' Summit in 2013. Kumamoto City has already expressed its candidacy as the host city; however, applications from other cities will be received until December 2010, and the host city will be decided by March 2011 through deliberation in writing.